World Laughter Day is here, and with it we humans are extolling all the virtues associated with good ‘ole laughter. The onslaught of laughter inducing events- laughing classes, workshops, groups and so on and so forth, is proof enough! But did you know that nature has its very own ways of paying homage to this amazing gesture called laughter? The cackle of chuckles is not uncommon in the wild, in dead of the night, albeit with a scary twist. For this is a behaviour exhibited by the canid prowlers of the nights- the spotted hyenas or the Crocuta crocuta. Thought a highly nocturnal species that is not very commonly seen, the distinct and high-pitched laughter is a sure shot giveaway of a spotted hyena’s presence. “laugh” is just one amongst the many communication modes that hyenas are gifted with for social living. Interestingly, the other three species i.e. the brown hyenas, striped hyenas and aardwolves are not capable of this giggling sound, it is a virtue of the spotted hyena alone. Spotted hyenas are highly social animals often living in clans of 80 to 90 individuals, and are required to communicate with each other for purposes of identification of individuals, identification of allies, social bonding and status indications, hunting or scavenging coordination and indicating aggression. A rich vocal repertory of over 12 widely varying vocalizations has been identified in spotted hyenas, and many of these can be further modulated by them to mean different things. The social setting of hyena society is very complex, it is a matrilineal society with females dominating both for feeding and dictating social norms. This degree of complexity demands a high degree of communication modes and means. And the famous hyena cackle is just one amongst the myriad vocal gifts to this canid. So when do hyenas giggle? A research at Berkeley was done on a group of captive hyenas to understand why and how they “laughed” or “giggled”, as we know it. Observations indicated that hyenas are most likely to giggle on being attacked, chased or disturbed while feeding. Social conflict also led to a great deal of giggling. This indicates that the sound is not actually laughter, but an expression of annoyance or frustration. The nature of the giggles too varies, primarily with age and social status in the clan. Findings suggested that the pitch of the “giggling” varied greatly, mostly depended on the hyena’s social status and age, with subordinate individuals’ and pups’ giggles being more high-pitched and varied. The frequency of laughter was another important varying factor. Junior-stature individuals were also found to emit the “laugh” more frequently, often when unable to compete for food. Alpha dominant females are the top-order of the hyena society, with subordinate females following her and males coming last in the hierarchy. This indicated that the giggle may be a call of frustration, rather than a merry chuckle. Ironically, this very giggle can pose a problem to the weaker ones by revealing their location when not desirable. For example, a giggling hyena carrying food will tend to attract other hyenas due to its loud giggling, often resulting in even more members joining in and more harassment by its group members! Perhaps, it would be best not to giggle and keep to oneself, the sadistic pleasure of having secured some food all to oneself! 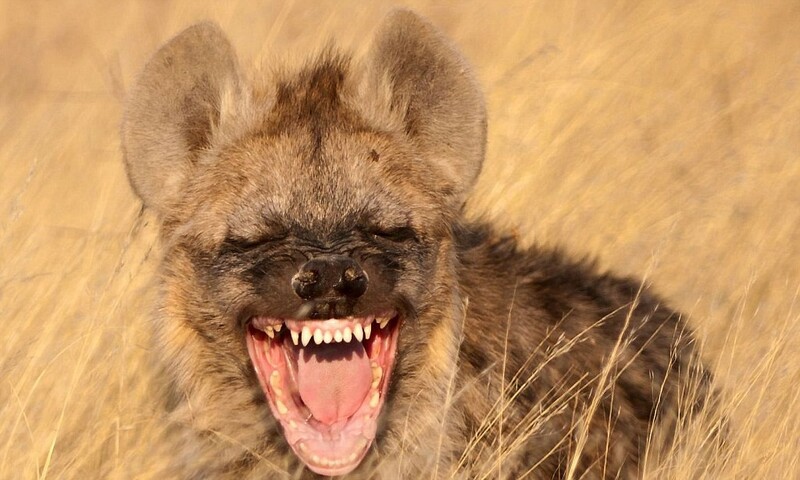 So the next time you respond to a hyena’s giggle with a chuckle of your own, watch out! What you may interpret as a friendly acknowledgement of unspoken camaraderie, may in fact turn out to be a nervous warning for you to get going on your own path without disturbing the sturdy beast. The similar sounds, yet distinctly opposite meanings, that’s the enigma called nature! Happy World Laughter Day !!!!! !